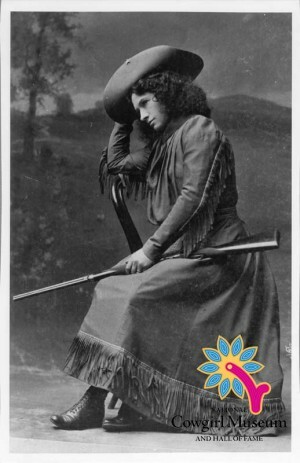 Annie Oakley (Phoebe Ann Moses Butler)became an international legend in her own lifetime based on her shooting skills. Born into poverty in Ohio, Annie taught herself to shoot to help feed her family. A shooting contest against future husband Frank Butler put her on the road to stardom. In 1885 she joined the Buffalo Bill’s Wild West Show as the only female performer. She traveled the globe as the World’s Champion Markswoman, hosting shooting clinics and performing onstage.